At the start of April I took up a 30 day challenge to go without sugar (allowing myself only honey as a subsitute). Well, I’ve been dreaming of chocolate cake, wasting time hunting down the best salted caramel recipe (a bizarre form of torture) – I even went out and bought myself a jar of runny honey to keep in my desk drawer to eat with plain yoghurt at 3pm. That said, the challenge was going well until my first restaurant review…when I fell off the wagon and in spectacular style. The crime scene was an Italian restaurant, which I was reviewing for View London. Show me an Italian dessert and… Well, in my defence how does a food writer live without sugar and how can I rate a restaurant meal without trying it? The answer: I can’t. Anyway, the fact is that I went and done it, yes, done it. I tried each dessert off the tasting menu of chocolate almond torte, ricotta cream, tiramisu and pannacotta. The next morning I scrambled back up onto the sugar-free wagon and continued the challenge until this week, when finally I realised that it was getting in the way of this blog and, look, who was I kidding? I have a lot of lovely baking recipes I want to share and another restaurant review to do this week. Enough. All was not in vain, however, because I discovered this lovely honey cheesecake tart recipe. On the day I baked them, there was an article in The Times Weekend by chef Michael Moore entitled ‘You can have your cake and eat it…with no sugar’. Avoiding too much sugar in food is something we’re all probably going to think about in the future – sugar is just everywhere and more and more people are being diagnosed with type 2 diabetes. If there’s one thing I learned from my failed challenge, it’s that I honestly don’t need to eat sugar every day and that you can learn to subsitute in many places. So, onto the food. I wanted to temper the sweetness of honey with a creamy and slightly sour cheese. So, I hunted around and found this recipe for Coventry Tartlets on the One hundred days of honey blog, written by Elizabeth Gowing, author of the book, Travels in Blood and Honey; becoming a beekeeper in Kosovo. 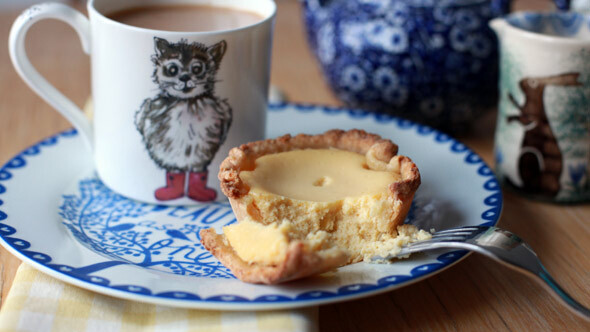 There aren’t many recipes about for Coventry Tartlets and Elizabeth traces hers to a booklet published by the American Honey Institute in 1941. I also used her recipe for honey pastry, changing the quantity and added ground almonds in place of some flour. I have tinkered with the filling, removing the salt and adding the zest of an orange. I would also recommend blind-baking the tart cases first, something neither Elizabeth nor I did, but best if you like your pastry crisp. Here’s my version of the recipe, which you can cross-reference with Elizabeth’s (she makes 1 lb of honey pastry, which I have revised down to 12 oz). Think mini cheesecakes – dense, sweet and creamy with a sour note from the cream cheese. The honey and almond pastry is a keeper too. Makes enough to line a deep 23cm/9 inch deep tart tin or to line 9 holes in a muffin tin. I used this deep muffin tin from Divertimenti. Lightly whisk together the milk and honey, until dissolved, then put it into the fridge to keep nice and cold. Sift the flour and salt together and rub the fat into the flour, then mix through the ground almonds. Add just enough of the honey and milk liquid to bring the dough together. 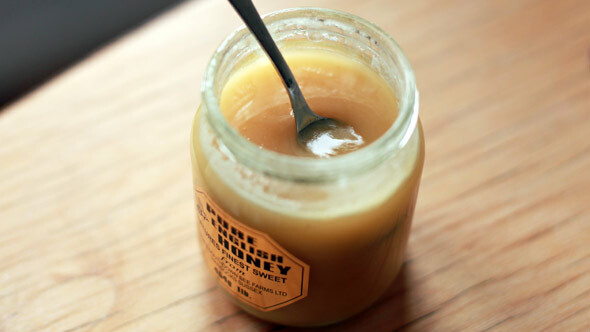 It won’t take more than two tablespoons, because the honey helps the mixture to bind. Wrap the dough in clingfilm and chill for half an hour or more. Roll the pastry out nice and thin then use a saucer, small bowl or whatever you have to hand to trace out circles large enough to slot into your tart tin. You want the pastry to come up a little higher than the tin edges, because it will shrink back. You could also use tartlet moulds or simply line a large 23cm/9 inch tart tin. 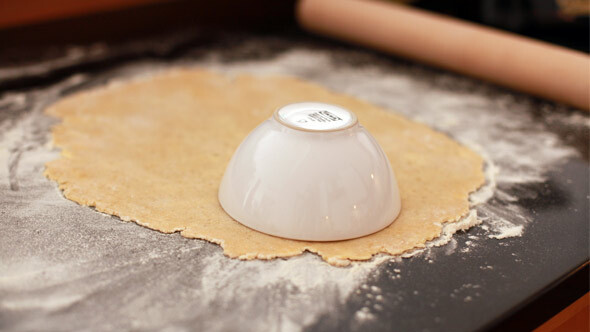 Line the tart moulds with your honey pastry, carefully pressing it into the edges using a little ball of pastry (a tip I learned to prevent tears). Once each mould is lined, prick the pastry with a fork and blind bake if you like nice crispy pastry (although I didn’t and they still came out lovely, if not super crisp on the bottom). If you are blind baking, brush the pastry cases with a little beaten egg and bake in a pre-heated oven gas mark 5, 375 F (190 C) for 20 minutes or until golden. Pre-heat the oven to gas mark 8, 450 F (230 C) ready for the next stage. 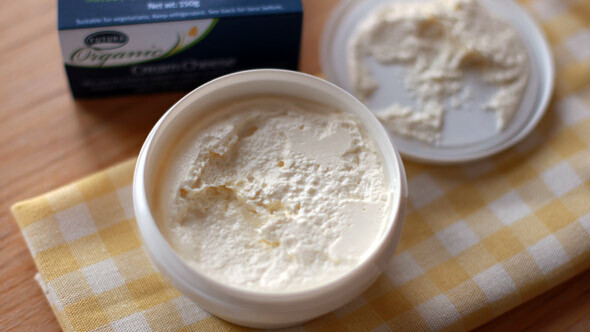 I love this Futura organic cream cheese, because it’s really creamy and has a lovely flavour, but Philadelphia will do fine. I found that simply beating all the ingredients together resulted in little lumps of cold butter throughout the mix. So, it’s best to beat the cream cheese and butter together first, making sure that the butter is very soft (I use the lowest setting on my microwave). Then beat in the honey, eggs, orange juice and spices. This will result in a smooth mix. 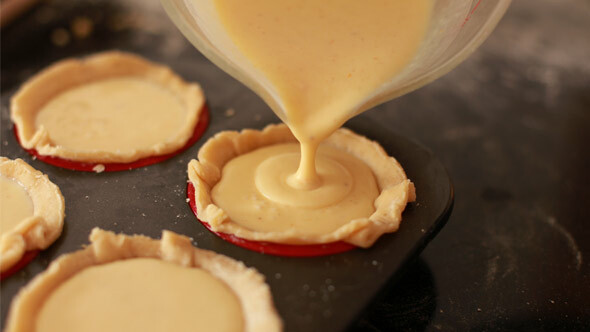 Pour the cream cheese filling into your tart cases, which should cool first if you blind-baked them. Then, bake at 230 C for the first 10 minutes then reduce the heat to 160 C (halfway between gas marks 2 and 3) for another 15 minutes until golden and puffed up. Leave them in the tin, removing to a cooling rack only once they are sturdy enough – about half an hour to an hour. The tarts will sink back down and are best eaten chilled and would be lovely with cold pouring cream. 15 Apr	This entry was published on April 15, 2013 at 1:54 pm. It’s filed under 30 day challenge, Recipes and tagged Baking, baking with honey, cheesecake, cream cheese, honey, sugar-free. Bookmark the permalink. Follow any comments here with the RSS feed for this post.